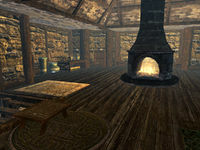 The House of Clan Cruel-Sea is a large manor house that is the home of the Cruel-Sea family, in Windhelm. It is located opposite Hjerim, in the northwestern area of the city. 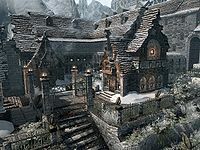 There is a square arch to pass under to approach this large fancy house, it is the largest house in Windhelm excluding the palace and contains numerous bottles of alto wine, wine and Nord mead along with fancy goblets, plates, bowls, jugs and food sacks. There are three food barrels to the left of the entrance and several mountain flowers planted in and around the front yard area. The front door is generally novice locked. Entering leads into a large room with a long wooden table with benches either side directly in front of you. Against the east wall is a small wardrobe containing fine clothes and a long end table. There is a doorway to the north with a small unit to the right. Against the west wall is a set of shelves holding a potion of minor stamina and a potion of healing. Through the doorway is another large room with a set of shelves against the east wall. To the north is an alcove with a tall wardrobe, several crates and cupboard holding a drum. There are a row of four weapon racks on the south wall and stairs leading up to the east against the north wall. The western end of the room is given over to use as a kitchen with a fireplace with a cooking spit in front and a long wooden table. There is an alcove to the south with a small set of shelves with a long wooden table with a woodcutter's axe on top. To the right is a cupboard containing clutter. To the right of the fireplace is a pile of firewood. In an alcove opposite the one to the south is a large vat, three food barrels and a couple of chairs. To the right are the stairs to the second floor. At the top of the stairs is a large room with a central fire pit with a chimney surround and a low table by the top of the stairs with a silver emerald necklace on top. Against the north wall is a small set of shelves with a long table to the right with steel sword, a small coin purse, a leather strip. There is another set of shelves to the east with a wooden bench with chairs flanking it to the right. In the southeastern corner is a large round table holding hide shield and a draught of lasting potency. To the right is a doorway with a second doorway to the southwest. Against the south wall are yet another set of shelves and to the west shelves, with another wooden bench to the right. Through the doorway to the southwest is a bedroom consists of a single bed in the southwestern corner, a small unit holding a draught of health and a draught of regeneration, a low table and an end table all to the south. To the north is a tall wardrobe containing fine clothes to the right of a doorway to another bedroom. 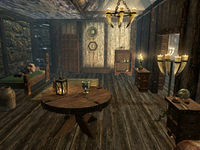 This bedroom is used by Torsten Cruel-Sea and consists of a single bed against the north wall, a tall wardrobe, long unlocked chest containing minor loot and a small set of shelves holding a potion of minor stamina, a potion of minor magicka and copies of 2920, First Seed, v3 and The Legend of Red Eagle all against the east wall. Against the south wall, to the left of the doorway is a small unit holding a draught of health, a draught of regeneration. To the right of the doorway is an end table holding a leather strip. There is a wash basin in the northwest corner and a round wooden table near the middle of the room. The doorway to the south from the room with the fire pit in leads to two further bedroom, the first has a doorway to the second, immediately on the left as you enter the first. The first bedroom contains a single bed against the south wall. A tall wardrobe and wash basin are against the east wall. In the southwest corner is a pair of shelves holding a potion of extra magicka, a draught of strength and a draught of health. Against the west wall is a large wooden table. Next to the doorway is a bookcase that is empty. 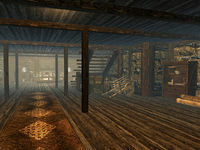 The final bedroom is used by Idesa Sadri and consists of a single bed against the east wall, with a set of shelves to the left holding a pickaxe and having a knapsack in front of them on the floor. Against the south wall is a small wardrobe with shelves above holding a potion of minor healing, a leather strip, with a lute leaning against them. In the southwest corner is a pair of shelves holding a potion of stamina and a potion of magicka. Against the west wall is a wash basin and tall wardrobe containing fine clothes. Finally in the northwest corner, next to the doorway is an end table. There is a Protected shadowmark to the top left of the entrance door and another on the bottom right pillar of the archway before the house. Despite the Protected shadowmarks, you can still be required to steal items from this house by the Thieves Guild, as part of Vex's radiant thievery jobs. This issue has been addressed by version 2.0.5 of the Unofficial Skyrim Patch; the house is no longer a valid quest target. This page was last modified on 20 February 2019, at 23:44.